Why Won’t God Bless Me? Although humorous, the professor’s intent in using the same answer was most likely that he wanted students to do what they needed to before they could expect an action from him. Spiritually, we can apply this same “check the website” principle when we start to feel that God isn’t blessing us. Although God isn’t as gruff as my husband’s instructor, and certainly wants us to come to Him and ask when we don’t know the answer in a situation, there are times that we can examine our actions against God’s Word and discover that we aren’t reaping what we want in a particular area because of what we are sowing. 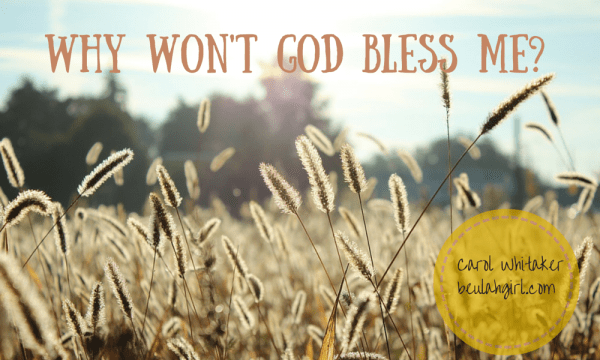 Essentially, Chambers points out that many of us are asking for a blessing when there is a reason we can’t have it, indirectly referring to the principle of reaping and sowing in the Bible. Just like the sun causes a shadow to fall across a sun dial when its rays hit the gnomon in order to tell the time, God’s truth causes our own examinations or “gnomons” to point to a particular problem in our lives when we subject ourselves to the light of His truth. Obviously, there are times when we don’t receive blessing because it isn’t in God’s timing or He has delayed his response to work out our character or His answer is no. Although this passage is talking primarily about those who spend their money on worldly pleasures while neglecting to support the church, we can apply this to other areas of our lives. As commentator Albert Barnes notes, “Every kind of grain will produce grain like itself.” If we are acting in ways that are corrupt in our relationships or our finances, those choices will eventually come back to affect us. I don’t know about you, but for most of my life I’ve worked on the external, making my outward actions look as good as possible for those around me, while hiding some secrets. But I hadn’t realized that this is essentially “mocking God” (v. 7). I can’t just pretend to be a good person. Merely assuming outward forms of Christian behavior does not deceive God. We may get away with our sin-hiding for a time, but the Bible is very clear that God notices our true motives even if we fool everyone around us. In essence, Galations 6 reminds us that our actions do have an impact on our lives. While, the lines cannot always be clearly drawn before our actions and the circumstances that come into our lives (sometimes bad things will happen even when we do what is right or vice versa), we need to understand the correlation between our actions and spiritual blessings. Therefore, if we want a spiritual blessing in our lives or we know God has promised us one, and we’re not receiving it, we can check the “index” — and evaluate our deeds and what fruit they are producing in our lives. A perfect example of the principle of sowing and reaping at work in my life is when we were attempting to sell our townhouse and move into a bigger home. Our house was on the market for a year and a half, and we hadn’t had a single offer. I kept telling myself it wasn’t selling because of the location, the cramped floor plan, the plain master bathroom, or the lack of a basement. However, those were not the answers that gave me any peace; there was something else, and I knew it. What came to mind when I prayed about it was an unpaid sum of money I had promised to the church. I had pledged a sum over a period of four years to help pay for a church remodeling project, and after making a few monthly payments, I had gotten lazy and stopped paying on the debt. A few years in, I still owed money to fulfill my commitment. When I received a check for some training I had completed for work and it was almost the exact amount I needed, I handed over the money to the remodeling fund and felt an instant sense of peace. One month later our “unsellable” house was under contract, and we were in the joyful process of looking for a new place to live. Checking the index in this case was not too painful; I had to give up some money I would rather have used on something else. However, there have been other times I have had to make awkward apologies or seek reconciliation with a friend after wronging them, and it was excruciatingly hard. Many times, I have not wanted to obey — I’ve wanted to just skip the process altogether. Index-checking is not a ritual or a legalistic practice I do to obtain righteousness; the Bible is clear that righteousness is a gift (Romans 3:20-25). In addition, God isn’t a genie handing out gifts if we earn His good favor. Nor do we need to constantly meditate on our wrongdoing or allow ourselves to feel condemnation for our sin. However, by reading His Word and allowing His truth to penetrate our hearts, we can know those areas where we need to let go of anger, make an apology, confess an area of bitterness, or pay money on a debt. In my own experience, God has offered me more grace than I really deserve. A lot of times when I think I know the problem but I am not sure, I’ll ask Him for confirmation, and He answers me. If we are seeking God intently, He will help us in the way to go. He will help us to know the areas we need to work on that are preventing us from receiving the blessing promised us. Thank you, Rachel. Unfortunately, I have learned this principle mainly through the not-so-great times in my life that I have reaped consequences as the result of my own bad choices, but lately, I have working on making wise choices — and I am expecting to reap some good from those decisions. Glad the post was a blessing to you.